As part of Simon & Garfunkel, Simon truly made his name as a composer and one half of a musical duo that defined the ’60s. 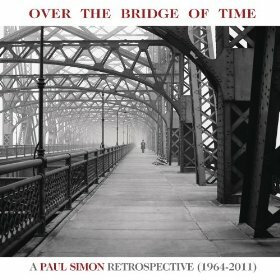 On the newly-released Over The Bridge of Time: Paul Simon Retrospective (1964-2011), we get six S & G tunes, from the early “The Sound of Silence,” through “America,” to my personal fave, “Cecilia,” and more. The mélange of instruments on “Celilia” in this remix alone reveals what a spectacular new digital production we have in this bunch of 20 tunes. Seeing as there are a bunch of Simon & Garfunkel and Paul Simon collections already on the market (even one that appeared last year of songs handpicked from Simon himself), I’m not sure what purpose this package serves. The album art is very cool though and the songs sound great.